AECB News : AECB Members receive Passive House Plus magazine including digital access as part of membership. Passive House Plus is the official partner magazine of the AECB and members receive a full subscription to the bimonthly paper copy which includes an online package of additional content and resources. You will automatically receive each printed magazine as a member but you can also sign up for digital access too which allows you to view exclusive online image galleries of plans and construction details of most of the buildings featured – including key insight into how to detail airtight, thermal bridge-free building fabric, using a broad range of different build methods. Go to www.aecb.net and sign in (top right hand corner) with your username and password. On the ‘home page’ click on ‘ Your Membership/Account Overview’. 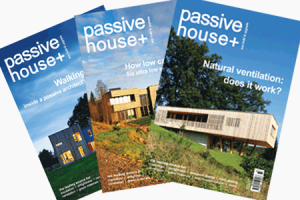 Scroll down to ‘Passive House Plus Magazine – Free Digital Content’ and note the discount code before clicking the link. If you need a reminder of your log in details please email emma@aecb.net. When logging in, you may be taken to the forum, click on the AECB logo to take you to the home page. Non members – see additional benefits and join here. This entry was posted on Thursday, August 20th, 2015 at 4:35 pm	and is filed under AECB Latest News. You can follow any responses to this entry through the RSS 2.0 feed. Both comments and pings are currently closed.